When visiting some of the largest luxury estates in Pebble Beach and Carmel, it is no surprise to see that many of them have chosen to use custom built “Old World Design” elements throughout their homes. From kitchens to dining rooms, living rooms, bathrooms, offices, wine cellars, doors, ceilings and windows, custom Old World-inspired elements create a permanence and livability not often found in other types of décor. These estate owners may very well enjoy a higher quality of living in their homes, often used for entertaining and quality family time. They appreciate that the Old World designed features and furniture will elegantly stand the test of time. So what exactly is “Old World Design”? According to HGTV, the hallmark of Old World design is a comfortable, broken-in look that shows the wear and tear of use. Textured walls, hand-trawled windows and walls, and tumbled marble exemplify the style. Distressed, matte and honed finishes are preferable to highly polished, reflective surfaces. Colors: The palette is deep, rich and regal but muted for a timeworn effect. Colors typically seen in an Old World room include burgundy, navy, forest green, ocher and cream. A combination of finishes can range from dark-stained surfaces to painted, glazed and sanded finishes that simulate (or account for) years of use. Accents: The polished surface on ceramic jars and the rustic quality of wrought iron are often paired for subtle contrast. Other elements that evoke an Old World look include woven tapestries, Aubusson rugs and a distressed gilt finish on accessories. Architecture: Rough-hewn beams lining a ceiling can balance the more sophisticated elements in the room. Other notable architectural features of an Old World-styled home include arched doorways and windows, which add feminine curves to a predominantly masculine design. 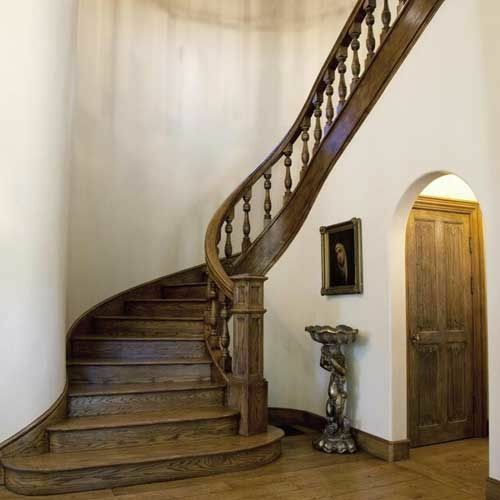 Old World Woodworking: This type of woodworking features distressed wood and worn furniture for an antique appearance. It favors older materials and traditional tools to create an atmosphere that seems to be from another time. The design often features heavier materials that are rustic yet durable. Kitchens in this style may have several arches in the design, and appliances may be disguised behind cabinets. Islands are ideal for old World style kitchens and may be painted or stained in a different manner than the rest of the cabinets. When using an old World style design, hinges and hardware are oversized and bold, which adds to the rustic appeal of the design. So, a custom built Old World home that will only look better and better with use? What could be better! Next time you choose to remodel your home, think about adding Old World design elements to it and enjoy!